LightEdge has advanced tremendously over the past two decades in business. From early beginnings as an Internet Service Provider (ISP) to officially moving away from the networking business to narrow in on compliant cloud and data centers. There have been countless product launches over the years based on market demand and cloud evolution. Four data centers built to Tier III standards have been constructed over the past 12 years spanning the Midwest, along with office locations and local teams and support in all of those cities. With all of these changes, one thing has remained the same: our dedication to providing the most secure cloud and colocation services in the industry for our clients. LightEdge has continually strived to maintain the best solutions and support for our customers throughout our past 22 years of business, and it’s still our driving force today. At the heart of our business is the passion to continuously explore new and better ways to keep your critical data safe so you can sleep easy at night. 2018 brought a big change to LightEdge in the form of an acquisition of another leading compliant hosting and colocation provider headquartered out of Austin, TX, OnRamp. This combining of forces has doubled the size of our staff, brought us some incredible new partnerships, and added three more highly secure and redundant data centers to our portfolio spanning Austin, TX and Raleigh, NC. This acquisition has also allowed us to take a step back and evaluate the solutions we are offering and the processes we have in place across both organizations. It’s been a wonderful opportunity to reflect and grow when it comes to implementing fresh tactics to continue to raise the bar for our clients and partners. We couldn’t be prouder of the great group of individuals we have on board all working towards achieving a united goal for the best in client experience and compliant offerings. Until the end of the year, OnRamp is operating as “OnRamp – A LightEdge Company”. Come January, they will officially be integrated into the LightEdge brand name. As we get closer to this full transition, we wanted to take this time to dive into LightEdge’s history (for those who don’t know us or even those who have been a part of this exciting journey with us through the years) and how it has shaped us into who we are today. We are excited to share this story with you as we enter this new chapter in our combined journey. LightEdge opened its doors back in April of 1996 as Lighthouse Communications. Just as it remains today, LightEdge was headquartered in Des Moines, IA with offices across the Midwest. In the early days, LightEdge focused on providing network services and managed hosting for regional clients. While our offerings have been drastically refined over time, LightEdge’s solutions have always been backed by one of the strongest service guarantees in the industry, and we remain committed to providing the best possible local service for our clients 24x7x365. Our roots in networking provided a deep expertise and major differentiator that is still invaluable today when it comes to delivering a true Hybrid Solution Center rich in leading infrastructure, connectivity, security, compliance, and control. LightEdge’s Chief Executive Officer, Jim Masterson, and Chief Operating Officer, Jeff Springborn, both joined the team five years after its inception and have been leading the company ever since. In fact, many of LightEdge’s leaders have been with the team for over 15 years, including their Vice President of Human Resources, Jody Gehl, their Vice President of Pre-Sales Engineering, Nate Olson-Daniel, and their Vice President of Product Architecture, Mike McHenry. In addition to our committed long-term leadership, LightEdge also has many hardworking employees that have watched the company evolve over the years. These individuals coupled with the motivated fresh faces, make the LightEdge company culture a great one to be a part of. LightEdge has always been committed to providing customers with the best IT solutions that are secure and reliable. In the early days, some of LightEdge’s products included Unified Communications, Networking, Consulting, and Managed Hosting. Today, many of our products have evolved and progressed as we left the Network business and our Professional Services team branched out to form Core2Cloud in the Des Moines marketplace. These changes allowed us to focus in on delivering our core competencies: cloud, colocation and compliance. This new focus has also allowed us to strategically expand our partner ecosystem and do business with some of the best in the world. As Des Moines continues to be a booming hub for technology companies and data centers, LightEdge was proud to be the first company to build a data center facility in Altoona, IA in 2006. Since then, companies including Facebook and Microsoft have followed in our footsteps constructing nearby facilities of their own. Back in November of 2006, LightEdge was the first to leverage the benefits that the State of Iowa offers to data center owners and tenants through personal property exemptions, sales tax credits and refunds for equipment, peripherals and utility bills. Due to its central US location and untapped land and fiber potential, Altoona, IA was a clear choice for LightEdge’s flagship data center. Based on the terrific growth that LightEdge was experiencing in the beginning, we would eventually open a second data center facility directly adjacent to our first facility exactly a decade later. More to come on the rest of our data centers later in this story. In 2008 LightEdge was purchased by the Anschutz Investment Company. This group is known for owning the Anschutz Entertainment Group (AEG) and Regal Entertainment Group, along with the Sprint Center in Kansas City, Qwest Communications, and the LA Kings. The founder, Phil Anschutz, has built fortunes in oil, railroads, telecom, real estate and entertainment over the past five decades. He is also known for his charitable contributions into organizations and universities around the globe. LightEdge was the first technology company that the Anschutz Investment Group owned and financially backed, and that’s a strong seal of approval and support we are proud to boast. As the years went on, LightEdge’s solutions became more focused. We honed in on what we did best, which was providing the most secure data centers for customers to host their vital data in and cloud computing services that allowed customers to advance and grow their business. As it remains today, security and compliance were a top priority and intertwined within each of our offerings. In April of 2014, LightEdge opened its underground data center facility in the SubTropolis Technology Center in Kansas City, MO. The data center grand opening took place on April 16th. A press conference and ribbon cutting ceremony were followed by tours of the facility and networking for the 300+ guests. Dignitaries in attendance included Missouri Governor, Jay Nixon, Kansas City, Missouri, Mayor Sly James, Presiding Clay County Commissioner, Pam Mason, KCP&L Vice President, Chuck Caisley, Augie Cruciotti, Managing Director of The Anschutz Investment Co., and members of the Hunt family including Clark Hunt, Lamar Hunt, Jr., and Sharron Hunt, owners of Hunt Midwest. The limestone mine that houses LightEdge’s Kansas City Data Center, SubTropolis, is the largest underground business complex in the world and a staggering 100+ feet underground. SubTropolis is well known for its safety and ideal climate where the original reels of Gone with the Wind and the Wizard of Oz are some of the items securely stowed away in the National Archives facility there. LightEdge was the anchor tenant of SubTropolis Technology Center, which is owned and operated by Hunt Midwest Real Estate Development. Back in 2013, LightEdge embarked on the journey to achieve our first major international certification, ISO 20000-1. In that same year, LightEdge completed its annual data center examination and successfully passed SSAE 16 (now SSAE 18). Another constant value that LightEdge has held through the years is philanthropy. Participating in charitable engagements has always been important to our company and team members. Whether that be donating our time or making a financial contribution, giving back to all of our local communities has been a staple of our Midwest presence. With the different programs, charities, and foundations that we have been a part of, LightEdge has always taken a special interest in at-risk youth and children’s education. LightEdge was the first company to get involved with the Center for Advanced Professional Studies (CAPS) programs at the Waukee school district, and has expanded their CAPS program reach to other schools in the Midwest. LightEdge brought in speakers, led tours through their facilities, provided hands-on technical projects for the students to complete, and even hosted an entire semester out of their office. Programs like these are now beginning to take shape all over the country, but we are proud to have been on the forefront. Other projects that LightEdge has worked on include adopting a garden that our employees tend to annually at the Child Development Center of Easter Seals Iowa’s Camp Sunnyside, participating in Variety: The Children’s Charity, providing school supplies to local students in need, meal packaging, and volunteering at the Homeless Youth Center. 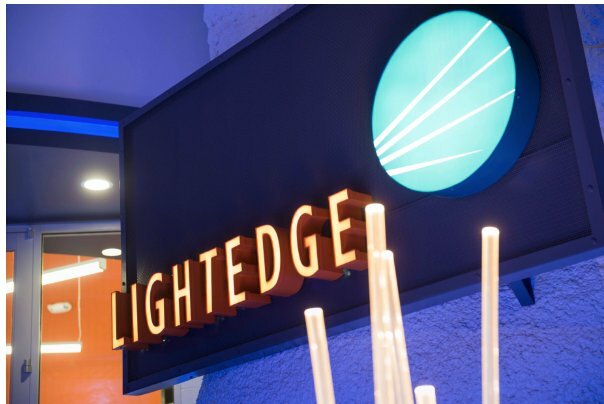 To keep up with the growing demand for audited and certified cloud and colocation providers, LightEdge has expanded its markets, employee size, data center facilities, and compliance and security offerings. As a company that has experienced many changes in the past two decades of business, we have found that many of our values and priorities have remained the same. Here are some exciting expansions and changes that LightEdge has experienced recently leading to the company that we are today. In July of 2017, LightEdge opened its second Altoona, IA data center. The construction took place on a 7.3-acre plot of land, directly adjacent to its current 30,000-square-foot building. Similar to the original facility, the second data center was designed to be broken out into four separate quadrants. It currently has two completed 10,000-square-foot data center suites and spans 48,000 square feet. There are provisions for an additional 26,000-square-foot expansion that would accommodate two more 10,000-square-foot data halls to be built out and powered up. When complete, it would reach an expansive 72,000 sq. ft. The new facility maintains LightEdge’s leading security and networking standards, while also providing customers with a sleek, 6,000-square-foot area for Workplace Recovery and meeting space, plus a 24x7x365 staffed Network Operations Center (NOC). In September of 2017, LightEdge acquired the Cabela’s data center facility in Omaha, NE. LightEdge took over the existing state-of-the-art Omaha data center and retrofit it to support LightEdge’s cloud and colocation services. The 16,925 square-foot facility was originally constructed in 2010 and sits on 4.18 acres of land. It was retrofit to complement LightEdge’s other data center facilities across the Midwest. Omaha continues to be an ideal location for the LightEdge data center thanks to the proximity to its other facilities for disaster recovery (DR), as well as, the Omaha airport, making transportation more convenient for business leaders to tour and move into the space. Other benefits of selecting Omaha include the highly available energy sources, minimal environmental and weather concerns, tax benefits for tenants, and the rapidly growing business scene. None of our accomplishments would have been possible without our talented team that makes up LightEdge. As our company expands, we have added many fresh new faces that have been essential to growing the company and keeping us competitive in the marketplace. One of LightEdge’s company values is work hard, play hard. With all the hard work our team puts in, we are also able to have fun. Some unique company culture traditions that make LightEdge a great place to work include our Annual Chili Cook-off, Festival of Trees & Lights Tradition, and Movember competition. It is this loyalty, culture, and drive of all our combined members that makes us who we are. In July of 2018, LightEdge made one of the biggest transformational changes yet. LightEdge expanded its geographical reach and acquired the Austin, Texas-based company, OnRamp. LightEdge and OnRamp both bring over 20 years of experience to the industry. We have both built deep expertise in achieving the world’s top compliance and security standards for our operations and our customers by hosting complex workloads for highly-regulated sectors like healthcare, financial services, education, and manufacturing. The acquisition expanded LightEdge’s team to both the Austin, TX and Raleigh, NC areas. This acquisition also puts LightEdge on the Electric Reliability Council of Texas (ERCOT) power grid, in addition to their presence on the Eastern grid. This dual-coverage and increased reliability will offer more value and flexibility for LightEdge customers. LightEdge now operates seven compliant data centers across the country. As of January 2019, OnRamp’s brand will be absorbed into LightEdge, and the two companies will officially become one under the LightEdge name. In August of 2018, LightEdge’s Professional Services team branched out to form a separate entity. Core2Cloud officially launched in the Greater Des Moines metro this past Summer, and is actively working with companies across the state of Iowa seeking expertise in networking, storage, backup and recovery, application delivery, cloud migration and implementation, and IT service management. Core2Cloud is comprised of some of the leading technology consultants in the area. Each member of the team has deep expertise working with industries ranging from banking to manufacturing to healthcare, and beyond. They also bring an extensive client portfolio of successful cloud migrations and implementations for some of the region’s top corporations. They have been and will continue to be a very valued partner to LightEdge. In September of 2018, LightEdge announced the expansion of their Kansas City data center facility in the SubTropolis Technology Center. Our plans are to expand the facility by 20,000 sq. ft. Of this latest expansion, 13,000 sq. ft will be dedicated to white floor space with the additional power to support it. Construction is slated to be completed by late March in 2019. Future phases with our partner, Hunt Midwest, are nearly unlimited with over 2,000,000 sq. ft of mission critical growth potential in the world’s largest underground business complex. Due to high demand for colocation and private suite space, LightEdge has no plans of slowing capacity – with the means to add 10,000 sq. ft build-outs in 6-month timeframes going forward. Based on tremendous demand, LightEdge is also announcing the expansion of our Omaha Compliant Colocation facility that opened earlier this year. We purchased the facility from Cabelas in Fall of 2016, and have completed all modifications and audits on the facility for multi-tenant hosting of colocation and cloud customers, including SOC 1, SOC 2, SOC 3, ISO 27001, and ISO 20000-1. We are officially announcing the ground breaking of the next phase of development to increase our white floor and power capacity. This phase will prepare the site for Phase 3 development where the facility will be expanded to house 30,000 square feet of white floor space and 3.0 MW of power. True to LightEdge’s model, all of our data centers are highly connected Hybrid Solution Centers where clients can integrate customer-owned computing platforms with LightEdge Compliant Cloud Services, along with direct private connections to public clouds. Each of our facilities are connected via a high-speed private backbone ensuring the top in redundancy and reliability. That means all of our clients have direct access between Des Moines 1, Des Moines 2, Austin 1, Austin 2, Kansas City, Omaha and Raleigh locations. With over 20 years in business, LightEdge offers a full stack of best-in-class IT services delivering flexibility, security, and control. Our solutions include premier colocation across seven purpose-built data centers spanning Des Moines, Kansas City, Omaha, Austin and Raleigh, industry-leading private Infrastructure as a Service (IaaS) and cloud platforms, and the top global security and compliance measures. Our owned and operated facilities, integrated DR solutions, and premium compliant cloud choices make up a true Hybrid Cloud Solution Center. LightEdge’s strong financial backing of the Anschutz Group empowers us to invest heavily in our markets. LightEdge annually undergoes third-party audits for ISO 20000-1, ISO 27001, HIPAA/HITRUST, PCI-DSS 3.2, and SSAE 18 SOC 1 Type II, SOC 2 Type II and SOC 3. For more information, visit www.www.lightedge.com.